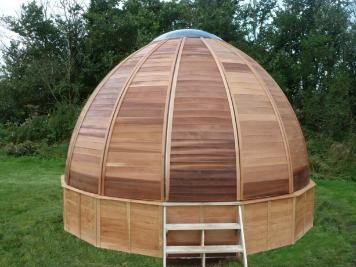 We're delighted to be working with our good friends at Unidome to bring you the first Stargazer wooden Unidome glamping pod available at a UK glamping site. A modern incarnation of a yurt; Unidomes can sleep two people. Made of ship lapped cedar; the stargazer glamping pod is reminiscent of a beehive. With glass between each panel and the large see-through dome in the centre of the ceiling the Stargazer is bright inside but perfectly secluded so shut the door and close yourself off from the outside world. The natural theme continues inside with the dome sitting atop the cedar clad panels to give you plenty of head room and space which give the stargazer glamping pod a tardis like feeling of being bigger than it looks. The double bed is located under the stargazer's skylight dome so you can cuddle up at night a see the stars. The Stargazer is perfect for a romantic retreat or a chilled glamping holiday for friends. 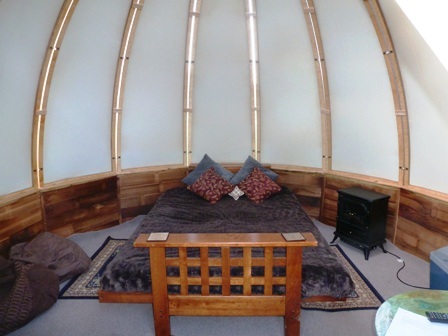 For 2014 the stargazer pod is from just £32.50 per person per night based on two sharing for four nights. Fancy making you stay in the stargazer glamping pod even more memorable? Why not hire a ceramic tangine from us and you can slowly cook a sumptuous meal in a fire pit whilst you watch the sun slowly slip away. Simply request tangine hire on when you make your stargazer glamping pod opposite. As the Uk's leading independent glamping site we are proud to offer the most diverse range of glamping in the country for the best value. As such, guests on a tight budget can enjoy a lovely glamping experience with us. If you wish to have a bit more luxury then we also offer a range of additional glamping services for guests to pre-book ranging from late check-in or late check-out, morning newspaper or morning tea, through to towels and maid service. Visit our Glamping services page for more details. To offer our guests the best value, from 2014 we operate a reducing price scale. Meaning that the price for a unit decreases per night, the longer a guest stays. Received a Stargazer Glamping Experience Voucher?